This short book contains the one thing salespeople are looking for: answers that will lead them to more sales now. "Great information Jennifer! Thanks so much for sharing! I re-read your e-book before a presentation yesterday and used your advice in Chapter 3 (Page 10). I shared the value of the service with the prospect, not the sales pitch and got an $8,000 sale in less than 30 minutes! Thank you – thank you – thank you! Wishing you continued personal and professional success!" 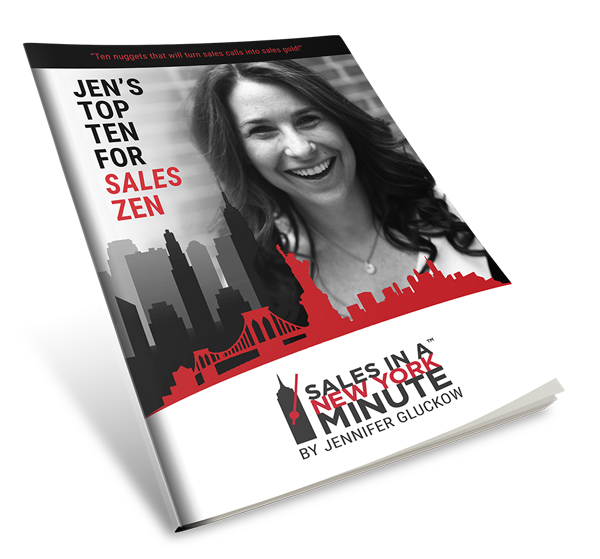 "Jennifer's book is immediately helpful, or should I say helpful in a New York Minute. Read it, re-read it, and keep it on your desk for daily reference - it's a classic." "I love how Jen's book ties directly to her YouTube channel - I am using both of them and they're helping me make sales. I can't thank her enough."